I plan to wake up in Orlando tomorrow morning. 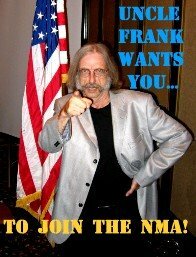 That will begin a week of LiveBlogging the NMA reunion. Okay, it doesn't officially start until Wednesday, but who doesn't love two days of photos of empty ballrooms and florid descriptions of the intolerable temperatures outside? It worked in San Antonio, it'll work here. That's the plan. However, my plane leaves Moline, IL at 1300, and the weatherman is calling for showers and thunderstorms this morning. I have a layover in Detroit and leave there at 1730, where showers and thunderstorms are expected at that time. Arrival in Orlando is scheduled for 2030, where, again, showers and thunderstorms are on the menu. And I just heard th-th-thunder. One little, distant, brief flamadiddle. But I'm worried. Well, one way or the other, I'll get to Orlando. And I hope you will, too. If you're still undecided--and a few of us are, juggling schedules, commitments, have-tos and want-tos--keep in mind that you're not getting any younger and the future isn't getting any longer. The NMA reunions are a tremendous way to celebrate an important part of our lives. Every one of us has offered our lives and skills to our country in hopes of building a better world; it was a noble investment, and it's fitting that we share the interest with each other. For those who must stay home, keep in touch. LiveBlogging the reunions means I see all comments shortly after they arrive here at NavyLyres. Your input is of great value--it proves that somebody is paying attention. And so, weather willing and the planes run roughly on time, I'll be back tomorrow with the new, improved NMA Reunion LiveBlog 2012, which will bear great resemblance, I'm sure, to it's earlier, unimproved predecessors. For those early arrivers...this Tuesday at 0900, please join myself and other fellow musicians and entertainers at the IHOP just 2 blocks up from the hotel. Every Tuesday we have a breakfast meeting of The Musicians Round Table. If you show up, ask the greeters for the back room where we meet.